Homemade jam ranks high on my list of favorite “from scratch” foods. We always had different types of freezer jam on hand when I was a kid, so I became completely spoiled in my standards of acceptable jam. Store- bought jam will just never measure up. So which type of jam do I prefer: regular strawberry jam like my mom made growing up, or this instant pot strawberry jam? I like both recipes for different reasons. My mom’s freezer strawberry jam recipe is made with fresh strawberries and you don’t cook them at all, so they have a really wonderful, bold strawberry flavor. It’s my first choice if comparing the two recipes just based off of flavor. It requires sure-jell fruit pectin, and the process takes a bit longer than this instant pot version. However, this instant pot version is much easier to make, and requires less sugar. The recipe does not use pectin, so you can use as much or little sugar as you like without having to worry that the jam wont set up. You could even substitute a sugar sweetener if you want, which would never work in my other recipe. 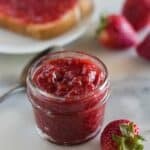 Both recipes are delicious, but homemade strawberry jam just doesn’t get any easier or faster than with this instant pot version. Involve your kids or grandkids, and reward them with a delicious piece of toast with jam, after it’s made. Perfect for a quick snack since it only takes about 30 minutes to make. 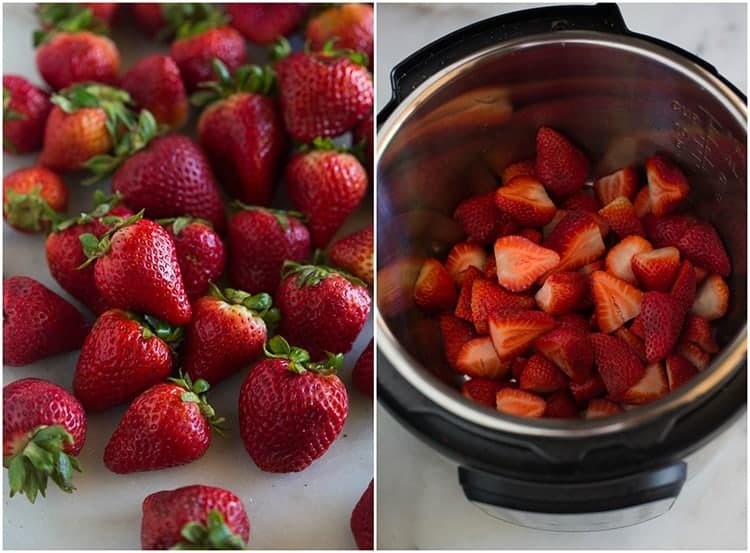 Add the hulled and halved strawberries, sugar, and lemon juice to the instant pot, give everything a stir and then let it sit for 10 minutes. The sugar will help draw juice from the strawberries. Close the instant pot lid and secure the pressure release valve. Cook on high pressure for 1 minute, followed by a 15 minute natural release. Meanwhile, combine the cornstarch and water. When the IP has naturally released the pressure, open the lip and store in the cornstarch slurry. Select the “saute” button on the instant pot and bring the mixture to a full boil. Boil for a few minutes, stirring constantly, until the jam has thickened slightly. It will continue to thicken as it cools. Turn the instant pot off. Can I use frozen strawberries, or another type of fruit? Use can use frozen strawberries. 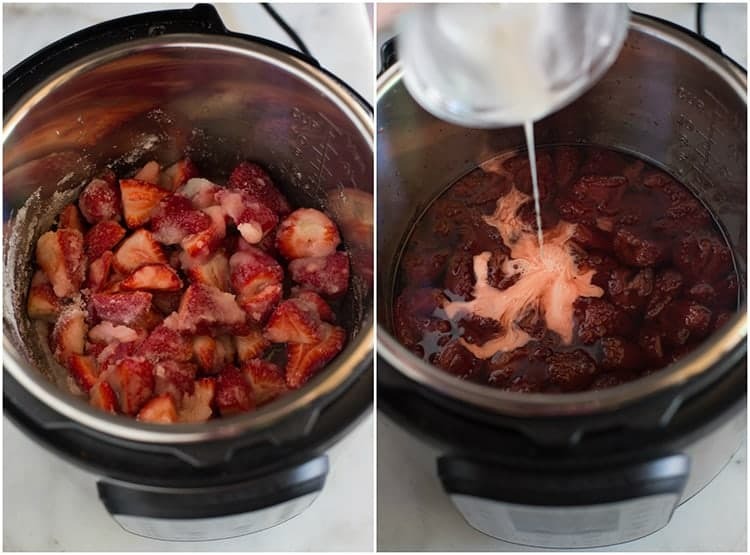 Since they will most likely be whole, you will want to increase the cook time by 1 minute and you may need to use an immersion blender when it’s finished cooking to break up bigger pieces of strawberry. I have tested this recipe substituting frozen raspberries and it worked great. I’m working on other types of fruit jam recipes made in the instant pot, and hope to share them soon! Meanwhile, try my peach, raspberry, or strawberry freezer jam recipes. Sure! Double or triple all of the ingredients, cook for the same amount of time (1 minute, with natural pressure release), and be careful not to fill your Instant pot past the max fill line. Can I use less sugar, or substitute an artificial sweetener? You could cut down the sugar to 1/4 cup, or use a sugar substitute if you’d like, but you wont get the same sweetness of flavor. I have not tested this recipe for home preserving (so test at your own discretion), but due to the natural high-acidity of the strawberries and the addition of lemon juice, I think it would work great. Use 1/4 cup of lemon juice, and saute the jam at the end until it reaches 220 degrees F. Then follow these instructions for preserving jam. 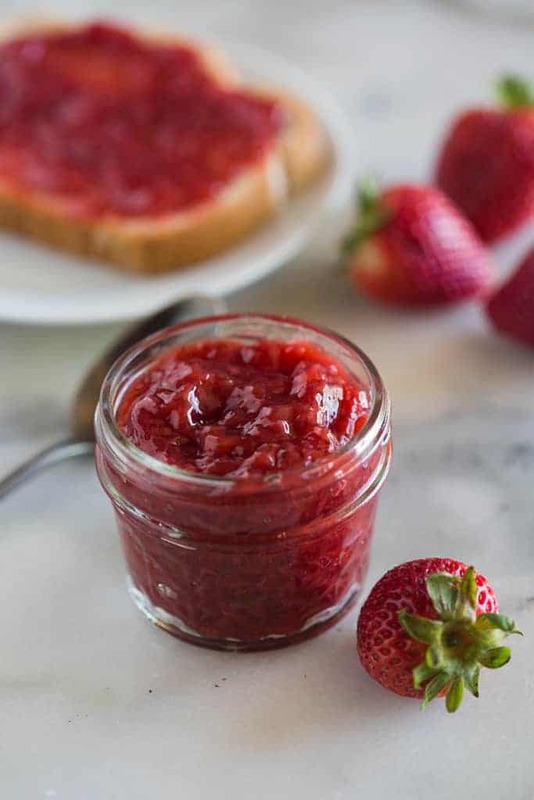 You may also store strawberry jam in the refrigerator for up to 3 weeks, or freeze in freezer-safe glass jars or plastic jars for up to 1 year. Do I need pectin or surejell to make jam in the instant pot? You don’t need fruit pectin or surejell for this instant pot recipe, since we thicken it with cornstarch instead. If you’re interested in making freezer jam or canning jam using fruit pectin, try one of my freezer jam recipes. Remove the IP lid (it will look like SOUP inside, but don't be alarmed!) Stir in cornstarch slurry. Select "saute" and bring the mixture to a full boil. Boil for a few minutes, stirring frequently until mixture has thickened. Turn off Instant pot. Pour jam into a container. Details about storing and preserving this jam recipe are above in the post. Makes 1 1/3 cup jam. Should I let the frozen berries thaw? First time I’ve ever made jam of any kind and this was easy and delicious!! I’m so glad I found this recipe, now I just need to convince the 10-year-old that it is better than store bought….insert eye roll here! Today was my second attempt at making IP strawberry jam. I goofed badly the first time by mistakenly using baking powder instead of cornstarch. Learn from me friends. Don’t do this! I ended up with some really funky purplish brown sludge. However. . .cooking is all about the do-over and do-over I did! Second time was the charm! Bright, bautiful, delicious . . . .perfect jam! Thanks for sharing your recipe. Any idea how long it will keep in the fridge?? I am going to attempt to use clear gel in place of corn starch. Can this be done with other berries? Yes, you can try it with other berries! Followed instructions. The jam overflowed out of the instant pot while cooking. What did I do wrong? That’s really strange–what size of instant pot do you have? Did you double the recipe? I have the 6 quart and I followed the ingredients/amounts listed. Was it sealed? Sounds like it din’t seal. Check the sealing ring. 1 1/2 tablespoons of water is no where near enough to make a slurry with three tablespoons of cornstarch.